30 months ago on November 30 th , 2015, leader of 20 countries came together to launch Mission Innovation (MI), a landmark 5 year commitment to accelerate the pace of innovation and make clean energy widely affordable and accessible worldwide. 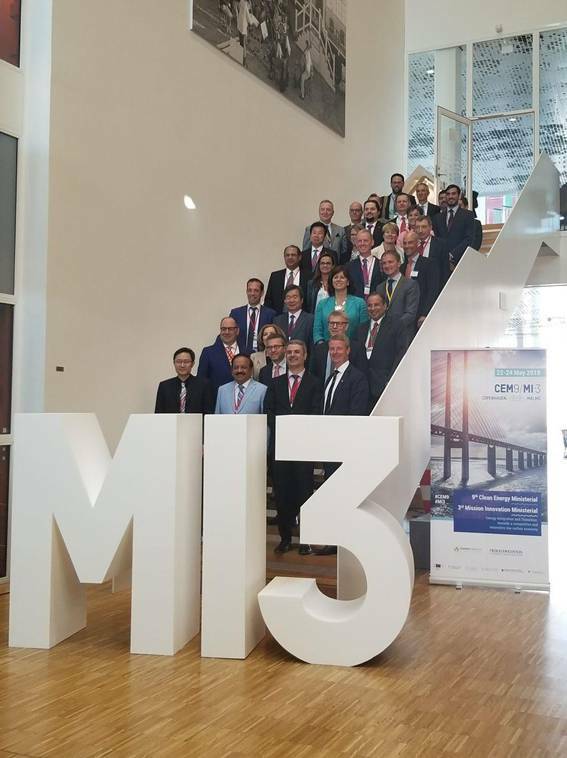 MI now comprises 23 economies and the European Commission, representing the European Union, and collectively accounts for more than 80 percent of the world's total public financing of clean energy R&D. This week Ministers and high level delegates from these countries converged at Malmo, Sweden for the 3 rd Mission Innovation Ministerial from 22-23 May, 2018. Indian delegation was lead by Dr. Harsh Vardhan, Union Minister for Science, Technology and Earth Sciences. The Minister and other delegates participated in several discussions with business leaders, clean energy innovators and policy makers to discuss plans, progress, country highlights and made a series of public announcements on identified areas of cooperation. Mission innovation countries launched Mission Innovation Champions Programme to felicitate clean energy innovators. At the Solutions Summit, the MI 2020 Solutions booklet was launched, showcasing over fifty cutting-edge breakthroughs emerging from MI members investments ranging from blockchain technologies to the world's first commercial passenger electric boat. A World Economic Forum White paper on public-private cooperation was also released. Dr Harsh Vardhan inaugurated Smart Grid Workshop on 22nd May, 2018 at Copenhagen and Chaired public private round table on Strategies on Decarbonisation through innovations in Smart Grids. He highlighted Government's commitment to clean energy and appraised the global community of several successes of Indian innovation landscape in scaling up clean energy innovations through examples on energy efficient lighting, clean fuel provision, rural electrification etc. India announced setting up of First International Incubator for clean energy in public-private partnership at a total investment of around US $ 5 million in Delhi. This incubator will foster entrepreneurship and promote innovations in the area of clean energy and provide opportunities to innovators across the MI countries to test their technologies in the local market. India also announced participation in global cooling innovation challenge to design a more efficient cooling solution catering to the typical housing unit in a highly populous city in India. India announced research programmes emanating out of MI centric funding opportunities in smart grids and off-grid access at a total investment of US $ 10 million which has participation of large number of Indian institutions and foreign entities. After successfully posting 2 international MI workshops on Smart Grids and sustainable bio-fuels, India announced its plan for hosting MI clean energy materials Workshop in October-November, 2018 at New Delhi. India also announced the launch of Joint Virtual Clean Energy Centre with United Kingdom and Indian Government funding of UK £ 5 million each. An Indo US Joint Clean Energy Research and Development Centre on energy storage and smart grids with a total investment of US$ 30 million with matching share of both the Governments and the Consortia has been launched. India also announced 3 dedicated MI funding opportunities on sustainable Bio-fuels, Carbon capture and Sunlight innovation challenge with a total investment of US $ 11 million.